The Dusit Laguna Resort, Phuket is a five-star hotel located amidst the tropical gardens and azure waters of the island of Phuket in Thailand. The hotel is part of Laguna Phuket, South-East Asia's first fully integrated resort, where you can enjoy the combined facilities of no less than five top hotels. 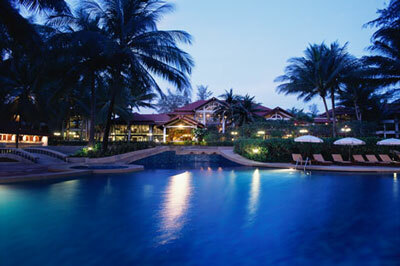 The idyllic surroundings of swaying coconut palms, vast lagoons and a white sand beach belie the fact the Dusit Laguna Resort, Phuket is only 22 kilometres from Phuket International Airport, and close to both Phuket town and a number of Phuket tourist sites including Wat Phra Tong and the Thalang Museum. A low-rise building in modern Thai style, Dusit Laguna Resort provides accommodation in 226 superbly appointed guest rooms and suites, including extra-spacious Landmark Suites, all with private balconies. The bright airy rooms are defined by native woods and tiles and decorated with ceramics, antique carvings and textiles. For visitors wanting a Phuket hotel with a wide variety of recreational facilities, Dusit Laguna Resort is the ideal choice. Resort facilities include a swimming pool, tennis courts, a fitness centre, recreation centre, kids' club, games room, jogging track, three-hole pitch and putt, water sports and the Angsana Spa. Guests at Dusit Laguna Resort, Phuket will also find an 18-hole golf course, outdoor adventure training centre and horse riding adjacent to the hotel.